"Collaborative consent" or Indigenous Rights: Condo development on Ottawa sacred site? “An exercise in reconciliation” is how an Ottawa Citizen newspaper title describes the ‘Zibi’ development project – timed precisely to counter today’s “It Is Sacred” walk in honour of the at-risk sacred site slated for the development. But what messages should the general public really be exposed to in order to foster a helpful understanding of this situation? The Algonquin Grandmothers and Elders leading the walk are doing so with a stated desire to bring unity and protection for their sacred site located at the Chaudière Falls on the Ottawa River just over a kilometre from the Parliament buildings. Josée Bourgeois of the developers’ Memengweshii Indigenous advisory council opens her Citizen opinion piece by declaring her concerns about the “attacks launched” against the planned development project. Who is attacking who may depend upon your perspective. Perhaps it is Indigenous Rights and their proponents that are being attacked here? Nine out of the ten federally recognized Algonquin Chiefs have publicly declared their unified intention to protect Akikodjiwan, the sacred site, from the development – to assert their Indigenous Rights for this special site on their unceded territory – but Bourgeois only mentions one Chief in her piece, that of her community of Pikwakanagan, who has been the only one supporting the development project. She doesn’t explicitly refer to the area as being sacred – her description is of a historical gathering place for portages, where “in more recent years” the one island not slated for development has become a place of “celebration and spirituality” (referring to Victoria Island, where Attawapiskat Chief Theresa Spence held her hunger strike). 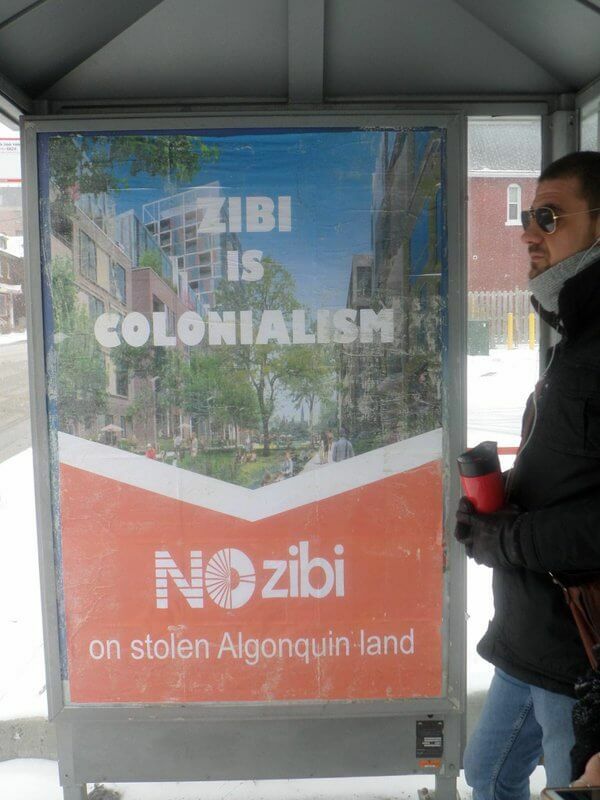 ‘Zibi’ was Windmill Development Inc’s choice for the name of their condo/business project, an Algonquin word for river selected in a competition without proper protocol through Algonquin communities (no Algonquins were on hand for the company’s public naming event). What ‘goals’ can this commercial development project realize for those who don’t want commercial development on their sacred site? In terms of ‘sitting at the table’, the majority of the Algonquin Chiefs have all along been asking for real consultation: not to meet with the developers, but for discussions with the government, who have the responsibility to honour the Canadian Constitution and the UNDRIP, including ‘FPIC’ (Free, Prior, and Informed Consent). Unfortunately, governments of all levels have mostly ignored – and continue to ignore – these requests for communication, discussion, and consultation. But Bennett has yet to meet with the nine Algonquin chiefs about this issue, even though the communications to her INAC office on this issue pre-date her taking the minister-ship last October, and it has been half a year since the AFN-QL and AFN passed their resolutions calling for government action – hopefully the wait will not be too much longer before the “earliest possible moment” she committed to is acted upon. and now a new version of the harmful ‘divide-and-conquer’ tactics that are seemingly used whenever corporate or government desires infringe upon Indigenous Rights and well-being. Hopefully the government – and all Canadians, including the developers – will agree, and this will mark a turn in the course of our country’s history, with government actively ensuring Indigenous Rights are respected instead of pretending not to notice and/or participating themselves in the violation of these Rights. How can we have peace and respect otherwise? The Algonquin Chiefs cite four different sections of the United Nations Declaration on the Right of Indigenous Peoples – articles 11, 12, 25, and 32 – that they feel apply in this situation. You can look up what these say if you aren’t familiar with them, and then decide for yourself if you think the Chiefs are correct in their assertions. And if so, what is a good way forward at this point? Many people may instead end up with the impression that the proposed development is a ‘no questions needed’ model of reconciliation that should be celebrated, rather than seeing the opportunity to really deal with some of the deepest issues of Canada’s colonial past/present – thus allowing for new possibilities of different, more reconciled and hopeful futures. Disclaimer: He was recently told “You and your non native self stay the $%÷@ put [sic] our business” by Josée Bourgeois on Facebook after posting a link to the late William Commanda’s 2010 presentation of the Asinabka Vision to a City of Ottawa committee, but has since been reassured by more experienced Indigenous activists, Algonquin and non-Algonquin, to keep on working in solidarity.